Best practices for taking donations online and on location. We’ve all heard of crowdfunding initiatives that have gone viral, like the Relief for Fidencio the paleta man GoFundMe campaign, which raised more than $384,000 for an 89-year-old Chicagoan who sold popsicles from a push-cart. But hoping that a crowdfunding campaign makes headlines and goes viral isn’t a reliable and sustainable way to raise money. So, while crowd funding platforms like GoFundMe have revolutionized donations and digital giving, they aren’t necessarily well-suited for charities and non-profit organizations. 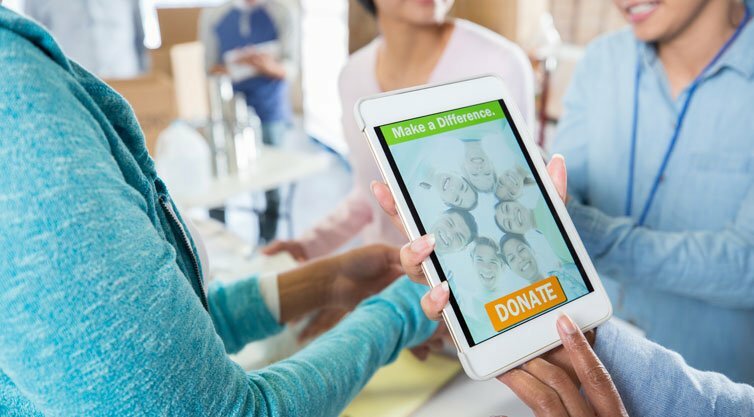 Charities and non-profits need to employ different strategies—and utilize different financial technology tools—to support their organizations on an ongoing basis. The good news is that the Internet has not only transformed digital giving, but there is also now a whole new generation of people who are heavily invested in donating their time and money. According to Giving USA™, Americans gave more than $410 billion to charity in 2017, “crossing the $400 billion mark for the first time.” And Millennials are leading the way to a more philanthropic future. Being younger, Millennials might not be donating as much in absolute dollars, but a high percentage are donating money—and their time. Research conducted by the Millennial Impact Report indicates that approximately 84% of millennial employees made a donation last year, with 78% of those who did not donate through their employers making a donation on their own. So the direct mail and telemarketing campaigns of days gone by aren’t necessarily the best way to reach potential donors. Never mind the fact that digital campaigns can be executed more quickly and cost effectively, and can more readily yield analytics that provide valuable insights about donors. Yet developing a destination for soliciting and collecting donations online requires attention to detail, not to mention developing high-quality content that illustrates the importance of your work. For one, it’s vital to communicate why people should donate—using words and visuals—as well as where the money is going and how it will be utilized. Also, the design and branding should be consistent across your Web site; consistent branding provides peace of mind for donors, who don’t want to be sent to a payment form off-site that doesn’t reflect the same branding as the charity or non-profit. Your site also needs to be secure and mobile friendly, and it should be easy for potential donors to find your donation page, with a link included at the top of your home page and your ‘ways to give’ page, among other places. display a list of suggested donation amounts with an explanation of what each level allows you to fund. It’s also imperative that you include a thank-you landing page or deliver a thank-you email, with helpful tips and example thank-you letters found here. Keep in mind, too, that you want to suggest next steps on your confirmation page or in your confirmation email, like sharing information about volunteer opportunities, inviting donors to your next event, or reminding them how their donation(s) will be used. You may also want to provide social media graphics that they can share with friends and family—i.e., other potential donors. Finally, one of the most important—and oftentimes least well optimized—parts of the donation/fundraising journey is the payment process. It’s at this stage where you have the opportunity to not only maximize the chance that a potential donor clicks the proverbial “donate now” button, but to also dramatically increase your retention rate and lifetime revenue (per donor) rate. First, you’ll want to offer a variety of payment options, while keeping the demographics of your donor base in mind. Older generations may be content with manually inputting their credit or debit card number into a form field, but millennials may prefer to pay differently—using Apple Pay®, for example. Recurring giving can be a huge difference-maker for your organization in terms of providing consistent cash flow, as well as increasing overall revenue. “According to Network for Good’s donation data, the average recurring donor will give 42% more in one year than those who give one-time gifts. Monthly donors also have a greater lifetime revenue per donor. Finally, 52% of millennials are more likely to give monthly vs. a large one-time donation.” All of which are good reasons to provide rewards, recognition and status to recurring donors. Don’t forget about mobile payment options, too, assuming your organization has the opportunity to take donations in-person or in-venue. Using the same mobile point-of-sale (mPOS) technology enjoyed by retailers, you can take donations anywhere at any time—using smartphones, tablets or other mobile devices. You may also want to consider utilizing giving kiosks or donation boxes with contactless payments functionality, the latter of which is enabled by Near Field Communication (NFC) technology. Giving kiosks are a brand-new way for charities and non-profit organizations to enable in-venue charitable giving—and to take payments for goods and services. Think of them as next generation donation boxes, except they can do more than simply serve as receptacles for coins and cash. A giving kiosk can also include multimedia, which has the potential to not only increase donations but improve the visitor/user experience.